If you need signs that are convenient, easily replaceable, and can stand up to the rigors of the outdoors, then A-frame sign printing is exactly the advertising solution your small business needs. A-frame signs, also known as sandwich boards, are connected by a hinge at the top, some with one board, and others with two connected boards. This allows A-frame signs to have excellent stability and portability and to be a good choice for small businesses that need to switch messages regularly, or store their signs inside their locations after closing time. 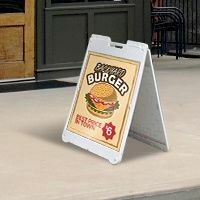 Custom A-frame signs are often found on sidewalks outside restaurants, cafes, and other small businesses. 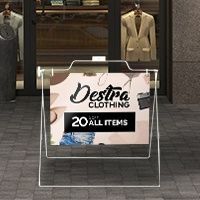 Their ability to position messages directly in the line of sight of pedestrians makes them usable for any small business or non-profit organization with a physical location that needs outdoor advertising. Choose between metal A-frame signs or plastic sandwich boards. Each of these options lets you transform sidewalks and hallways into powerful advertising platforms. You can order both frames and signs, or just the sign and add it to your existing frames. Start owning the sidewalk and start getting eyes on your business. Try sidewalk sign printing now and have your sign ready as soon as the next business day.